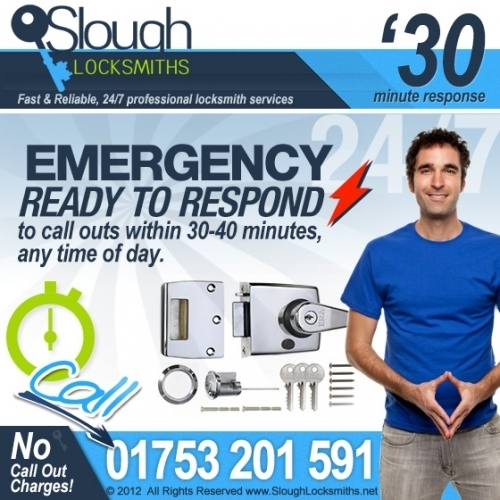 Slough Locksmiths - got a lock and key problem? Our team of professional locksmiths in Slough provide 24 hour locksmith service in and around the Slough area. We carry and install top of the line security products such as locks, keys, safes and security systems at great prices. Just call - 01753 201 591 to find out more! Top Service!! Fast and reliable! Thanks Slough locksmiths- you people really are reliable - I called at 10:15 to ask for help with my car key that was giving me trouble- by 10:30 the technician was fixing the problem - he explained to me what it was and what he was doingand did it - I had my car checked at the garage and they couldn't even tell there had been a problem- they were impressed with the work- I was impressed with the speed of service! There was no call out charge and no extra for hidden charges. Will definitely recommend.